Hey! Dani here, game designer and half of the community management team at Little Miracles Games. As you may know, we are working on our second game: Jelly Is Life. 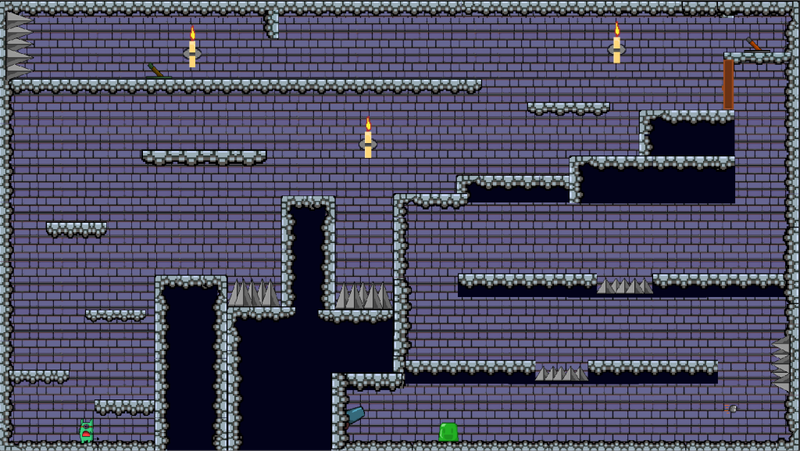 It is a 2D platformer in which you jump, die, bounce, shoot and die a bit more over small levels. There is a story mode, challenges for one and two players, character customization… Starting like this, you can imagine that we’ll explain you a bit about Jelly Is Life… well, actually, about its genesis. The alpha version. The one that has little to do with the thirsty-for-new-features monster in which the game is becoming. And it all started, like so many other modern game development stories, with a jam. There was a double list of topics. You had to choose one from the first row, another from the second and then make a game with it. I don’t remember their exact placement, but there were sharks, UFOs, limited resources, gelatin, one-button control… from all these options, we would eventually choose the latter two, which would determine our core gameplay: you jump with a button, the only action the player can perform, and the goal of each level is getting to the gelatin. But this came after. Let’s rewind. It was a somewhat unusual jam: we had five days, not one or two or three. So, we met the first day for half an hour to decide, among the five members of our group, how to proceed. In the end we established another hour to individually choose a set of topics and think about a number of proposals which would be exposed later. That first day we gathered some very interesting ideas, but eventually we ended up choosing Jelly Is Life for several reasons. It seemed affordable for the resources we had, it seemed a fun idea to play, it allowed us to add improvements and more content easily if we had any time left in the end… The basis of the game was the two-player mode, but that same day we determined that we should also give the option for one player if we wanted to reach more people. 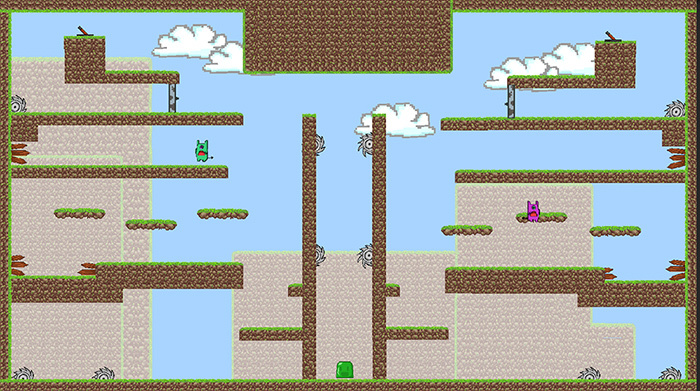 The second day began with the design of characters and levels. 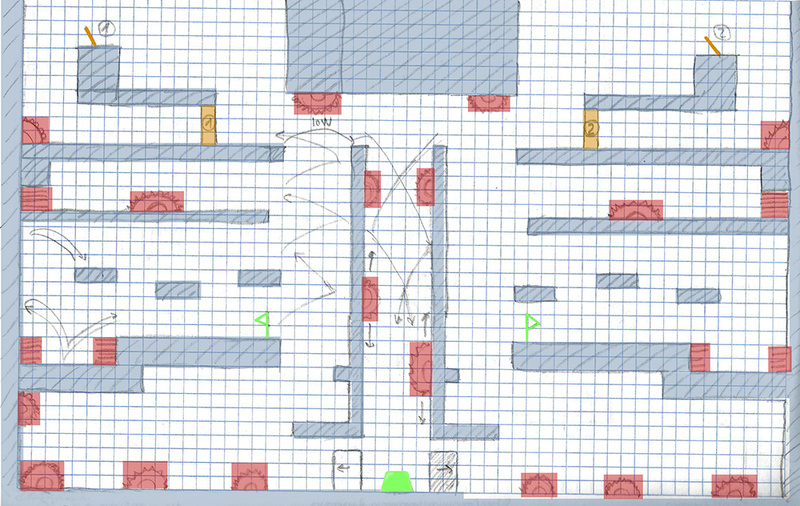 Our idea was to create five or six themed levels and their counterpart for two players: we had a tutorial world, a dungeon, a castle, a forest, a factory, heaven… From the beginning it was clear that the multiplayer levels should be symmetrical for the sake of gameplay while similar to their corresponding solo challenges, but in the end they were far from simple adaptations and ended up proposing a unique and distinct challenge. And then, three more days passed: we had the character to design, which went very fast, the tiles and environmental assets to draw, the levels themselves … and, of course, we had to program the basic control of the game. In the end, it was about making a character who walked endlessly and could jump and bounce off the walls, creating some kind of assisted double jump system. Also notable is the introduction of a variable height jump, a capability we took advantage of in various challenges throughout the levels. To summarize this part, I’ll say that the Unity Endless Runner Tutorial by gamesplusjameswas very helpful. The engine, of course, was Unity3D. About level design, there is little to discuss. Basically, every map in the game is contained in the screen, so it’s always “what you see is what you get” (or, more precisely, “what you see is where you can get”). You have to go from point A to point B dodging traps, jumping between platforms and opening doors. It’s easy to conceptualize, but keeping it fresh becomes somewhat complicated after several iterations. We quickly realized that some of our early designs did not work too well when moved from paper to screen, but luckily we had time to correct them at some points and to introduce a couple of tutorials that facilitated the learning process. Ah, audio. We had it in mind since the beginning, so we scheduled a generous period in the last days to compose three simple themes and the sound effects we needed (jump, cannon shoot, death… that’s pretty much everything). Eventually, the sound panorama became too scarce, mostly because of the feeling of repetition after hearing the same 30-second loopings for hours and days, but it certainly did the job in the first stage. We’re very grateful for being able to use free and accessible tools such as Bosca Ceoil for the music and BFXR for the sound effects. Finally, we had time to finish it, test it and submit a product that everyone enjoyed (in fact, we won the jam!). We got to createfive pairs of levels, which guaranteed a fair amount of fun. We included different pairs of opposite hats as our character customization tool: there was Naruto versus Luffy, Minions versus Rabbids, cowboys versus American Indians and Toad versus Sonic. Anyway. Jelly is Life had many shortcomings, but we also saw its potential. So here we are now, with an idea that was born this way and now has become much more than that… but for that part you’ll have to wait to the upcoming entries! And in the next episode… gelatin and tapas: our first time in a game show.